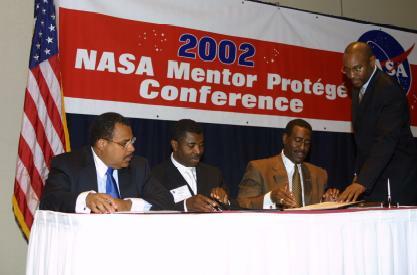 A new NASA Mentor-Protégé relationship was secured with the signing ceremony of RS Information Systems, Inc. and Delta Computer Solutions, Inc. Rodney P. Hunt, President, RSIS, had wanted to initiate the Mentor-Protégé program while RSIS was still in the 8(a) program. RS Information Systems specializes in information technology with engineering, scientific services, and management solutions. During some of RSIS’ marketing trips to NASA Ames Research Center, Hunt heard from the Ames researchers about a small company, Delta Computer Solutions. Rodney Hunt met with Steve Ike, Delta’s president, and they decided they shared the same technology background, and as importantly, the same customer and employee focus that had been the foundation of RSIS’ success. Delta Computer Solutions is an up and coming 8(a) and hub zone company specializing in software engineering, real-time systems, and web-enabled applications development for federal, local government and commercial clients such as NASA, Department of Energy, Department of Labor, Lockheed Martin, The Boeing Company, Booz Allen Hamilton and Raytheon. Delta Computer Solutions was recognized as the 2001 Supplier of the Year by the Northern California Supplier Development Council. In entering this Mentor-Protégé program RSIS will subcontract to Delta Computer Solutions for support in the Technical Information Services Branch on RSIS’ contract at Goddard Space Flight Center. Delta will provide the design and build out for secure and 508-compliant web sites for Goddard customer organizations. Also Delta will provide enhancements to the web-based custom software that is used to log and track response times, repair times and customer call history. In addition to the technical work, RSIS will provide mentorship to Delta in business development practices and administrative support in the areas of human resources, contracts and accounting and finance.